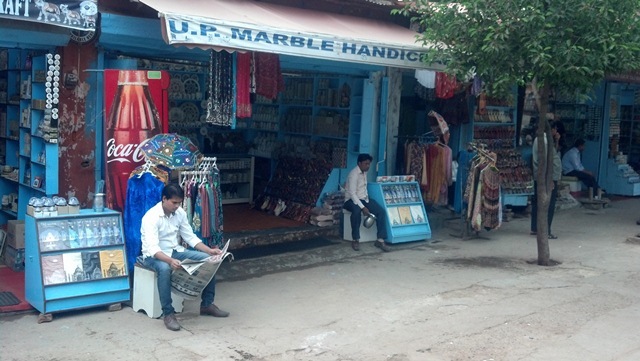 Some of you may know this, but some of you may not (I didn't) but the Taj Mahal is near the city of Agra. 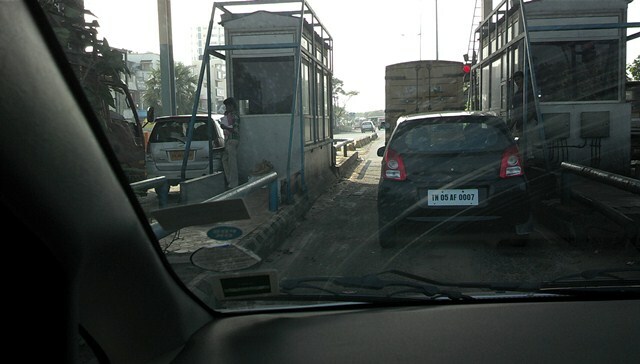 Whenever I pictured the Taj Mahal in my mind, I thought of a structure that was just there. I didn't give any thought to what might be near it. Well, here are some pictures of the city itself. 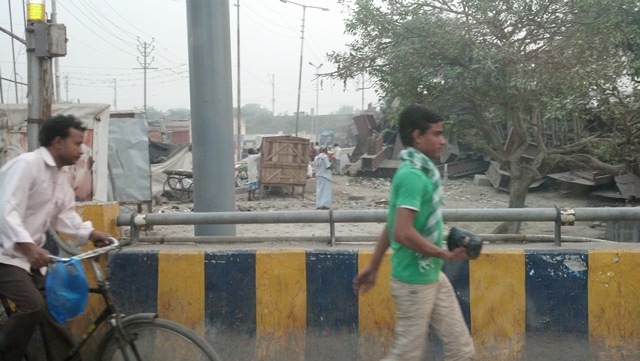 Some of them are from us driving through the city and others are from when we stopped to eat. 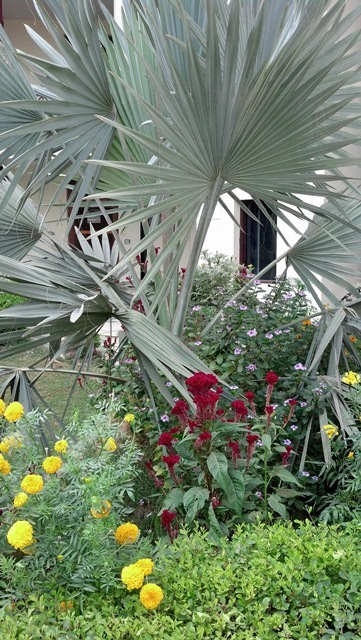 One set of pictures in particular are from a very special visit to someone's home. Please note, most of these pictures (if not all) were taken by my co-worker Phil. 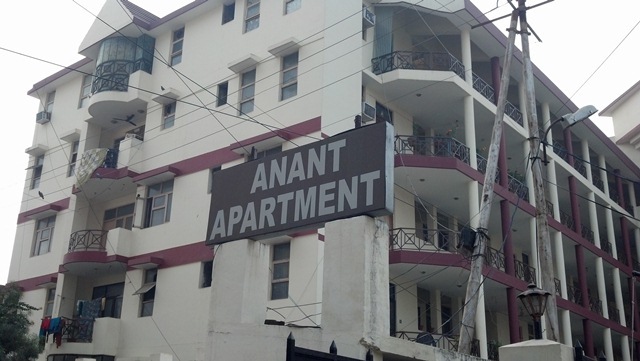 He really captured the Agra experience. 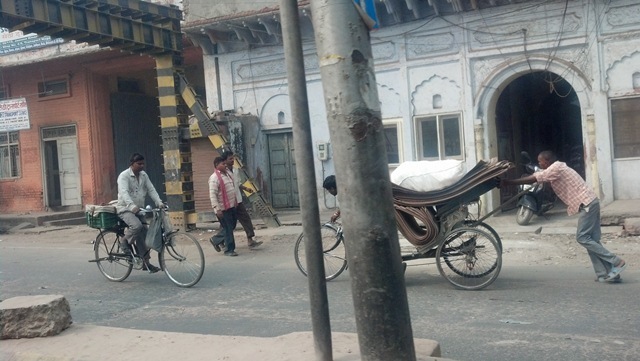 In Agra as in other cities, we mostly saw motorcycles on the road. The're small, nimble and economical too. I don't know what these guys were transporting on that tricycle, but it must have been heavy since 1 person was pushing from the back. The temperature that day (11/3/2012) had to be around 80f/27c and these guys are wearing long sleeved shirts and in some cases a scarf. I have no idea what those round rocks are for. 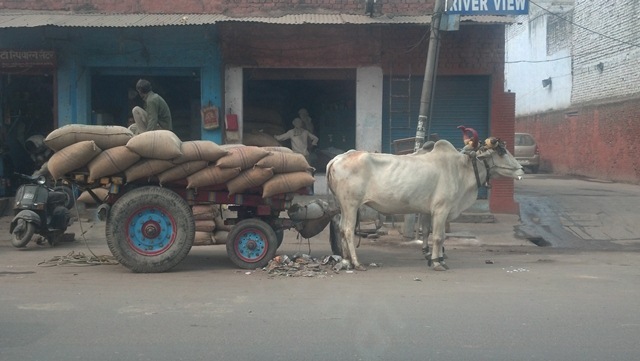 In Agra, we saw more carts/wagons pulled by cows than we did when we were in Chennai. There were a lot of food shops just off the street. At night they were very crowded. 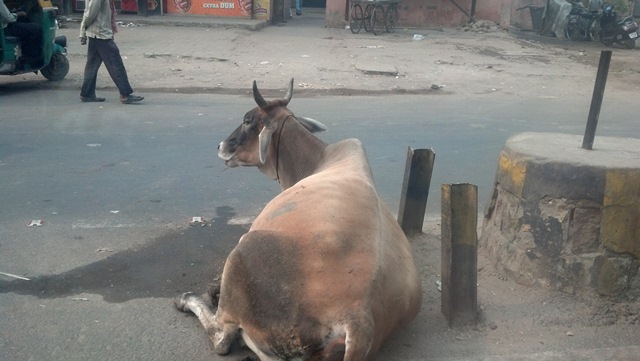 A cow resting near a road divider. 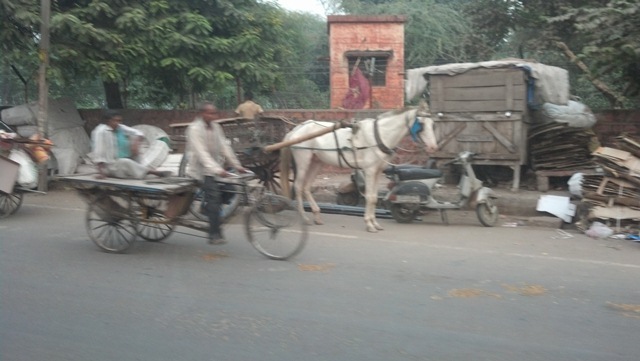 There were a lot of these carts too, usually pulled by a horse. 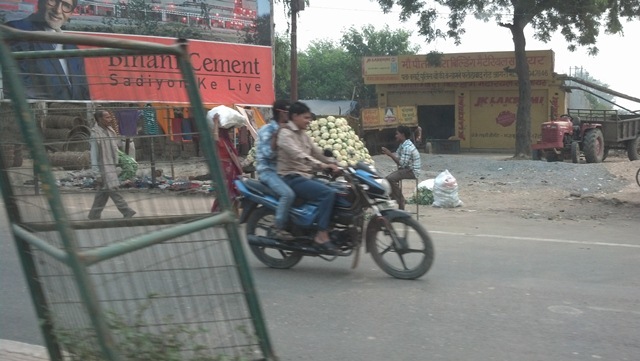 What you see behind the motorcycle is a vendor selling cauliflower from a cart. 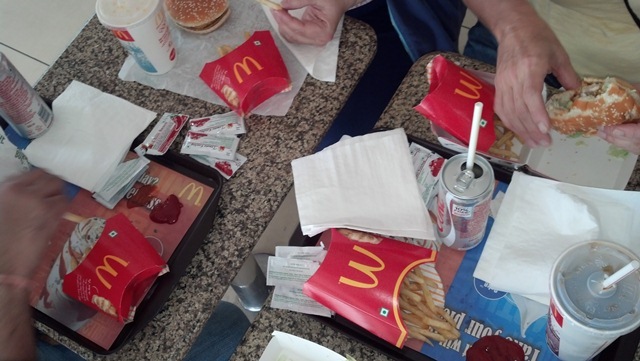 Our Cognizant co-worker/guide, Mohit took pity on us and brought us to a McDonald's in Agra. 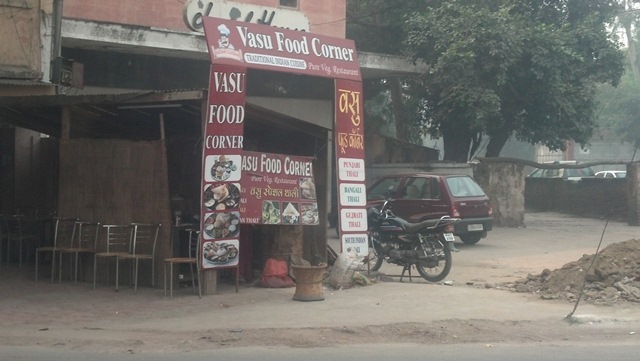 He probably realized that we were getting a bit tired of Indian food. 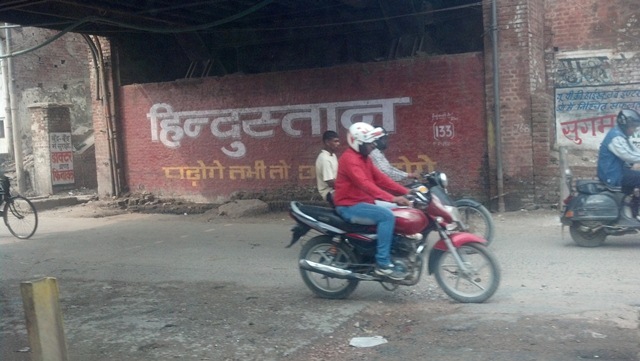 At the India McDonald's there were no hamburgers on the menu that contained beef. You had a choice of veggie burgers or a chicken sandwich. I can't remember if they had fish on the menu at this one. It may be spelled wrong, but it get's the point across. 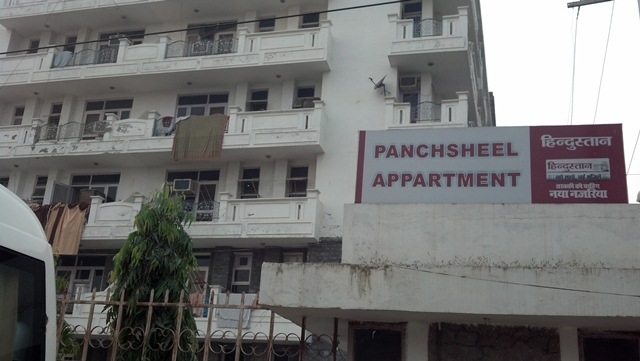 Here is the apartment complex that we visited. 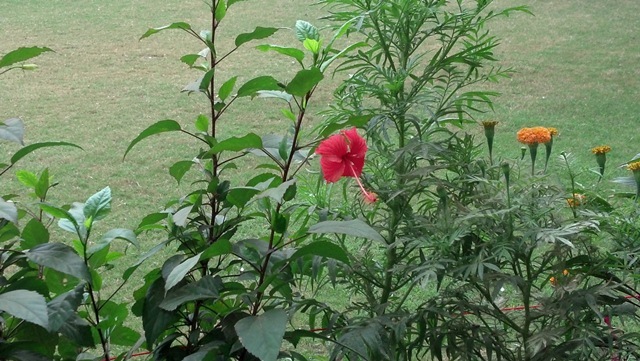 Mohit's brother lives here with his family and we were invited over to their apartment for coffee & tea. 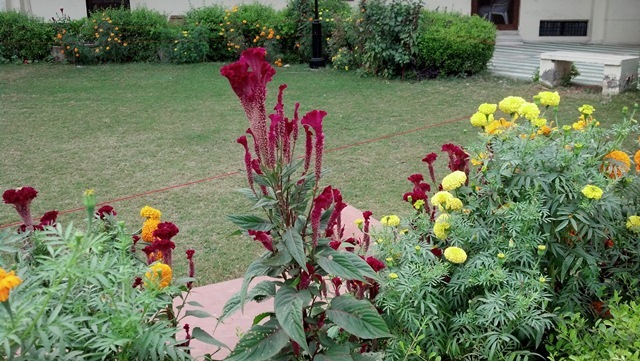 Here are some of the flowers in the courtyard of the apartments. 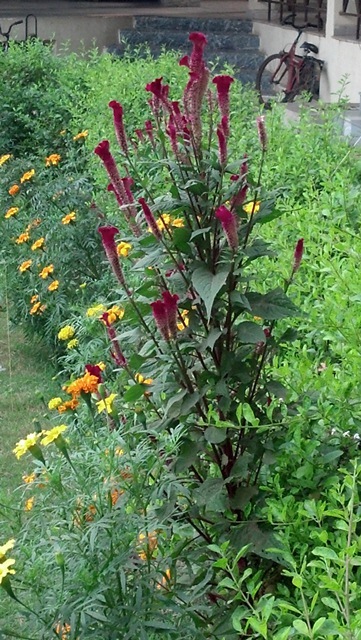 The yellow flowers are Marigolds and the red flowers are what we call Cockscomb. They were over 3 feet tall! What makes this so amazing to me is that I have never seen them grow more than 6-7 inches in a season where I have lived in the USA. They were quite stunning. 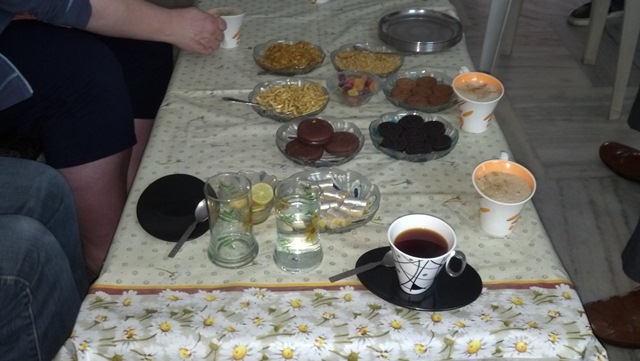 Tea, coffee and refreshments. It was a wonderful break in the day. Just being able to relax and meet Mohit's family was nice. They were very gracious to have us visit on such short notice. 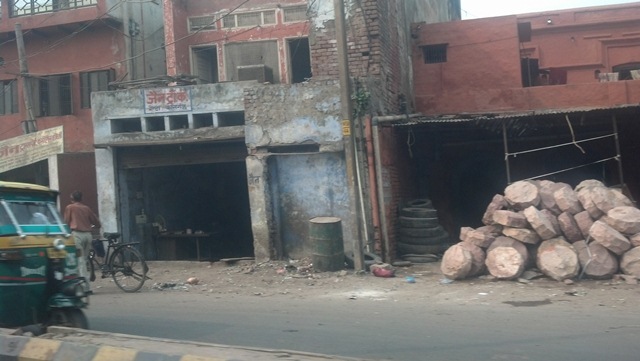 Oh, and Mohit's brother owns an ice cream distributorship in Agra, so we got to sample a LOT of product before we had the refreshments you see here. What a wonderful, wonderful experience! Here's a picture of Melanie, me, Mohit & Mohit's uncle. The coffee we were drinking was GREAT! 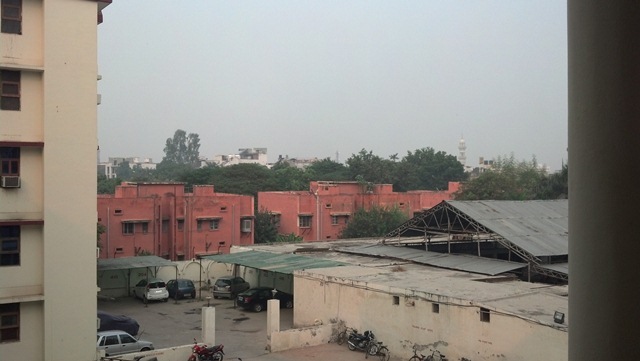 A view of Agra from the apartment. 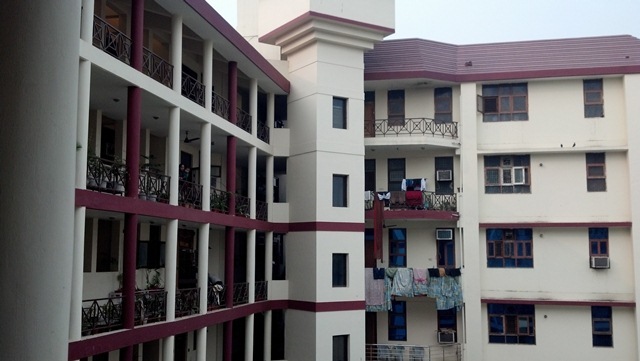 Another view of the apartment complex. 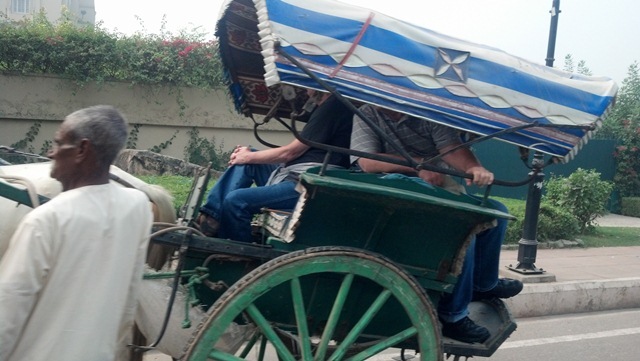 Back on the road, here you see a packed Tuk-Tuk. I think there may have been 6 people piled into this vehicle, including the driver! Not a very focused picture. Not bad though considering it was from a moving vehicle. 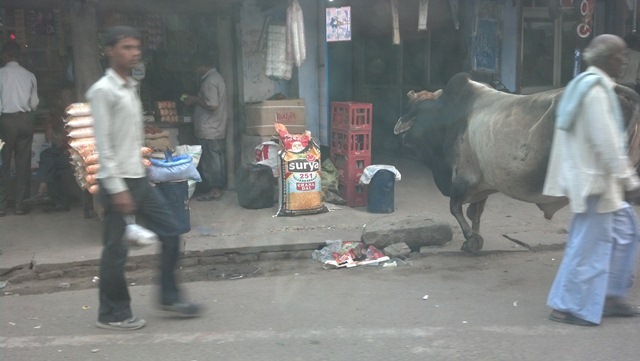 This guy (cow) looked like he goes wherever he wants. 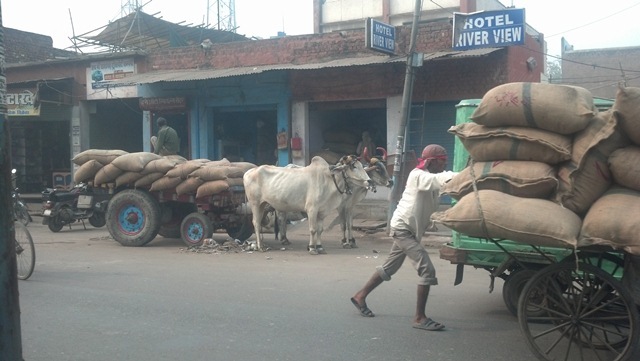 The city of Agra was an exciting place to be and I am very happy we got to see it. 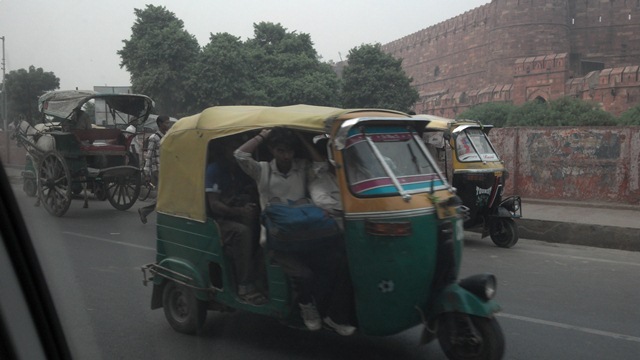 Click here for more travel information on Agra.